The word cloud above consists of my posts from this blog. The word cloud displays the most repeated words in a larger text than other words used from my posts. 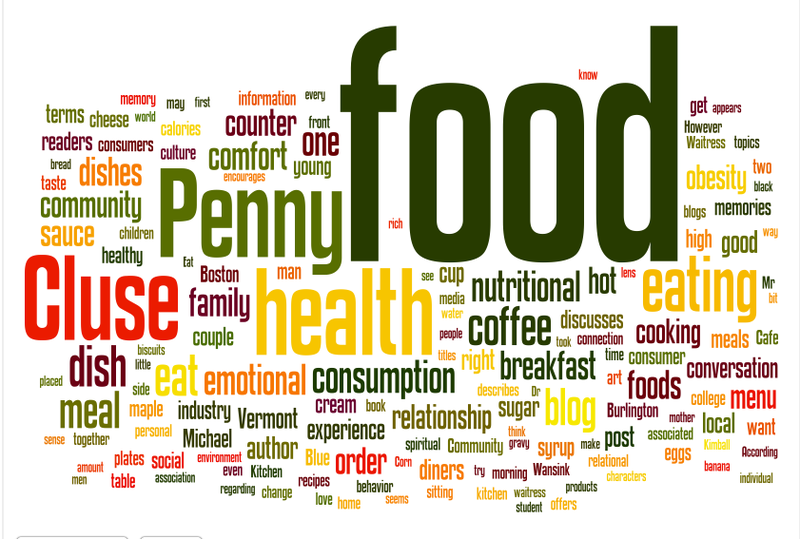 The patterns of my wordle reflect the topics I ventured out to observe at Penny Cluse: food, health, eating, and consumption. Food appears to be the most used word, which is not surprising seeing that this is a blog about the relationship between food and health. The words reflect my experiences, conversations, and the type relationship I have with Penny Cluse. My current understanding of the relationship among food, health, and media is that as a blogger, I can use media to spark the conversation about food and health. Using media as a tool to continue discussing our eating habits in relation to our health allows readers to reflect on eating habits. The Word Cloud displays a change in my understanding of food, health and media from the beginning of the blog because in my early posts, I talk more about the relationship between the waiters and myself. https://apennycluseforyourthoughts.wordpress.com/2012/01/31/talk-over-tofu/. At the beginning I wanted to observe the relationship between the staff and a “regular”, but I quickly realized that there were rich observations if I allowed myself to let go of that goal. I narrowed my observation, which was limiting, but I started to simply absorb my environment and scribble anything and everything that I could hear, smell, see, and touch. I would later try to mold all the scribble into a viable blog post. At first I was hesitant to open up and talk about my personal memories for all to see, but I let go and reflected on how I can weave the observations at Penny Cluse with my precious memories. This post is my “Aha” moment! As I kept eating delicious food, observing, and posting, I found myself in a funk. I wanted something different and unique in my post. I went to my professor Dr. Sarah Heiss, who graciously guided me to Laura L Ellingson: Engaging Crystallization in Qualitative Research: An Introduction. From this reading I found that one could use artistic and creative outlet as a representation of crystallized account. I decided to use a poetic transcription to represent my observation about food and health. This post is by far my favorite! Overall, I believe the Word Cloud reflects my time spent at Penny Cluse, but it does not truly capture the experience I had, whether it be the excitement of trying a new dish, the sound of the kitchen on a busy Sunday morning, or the smell of baked beans. 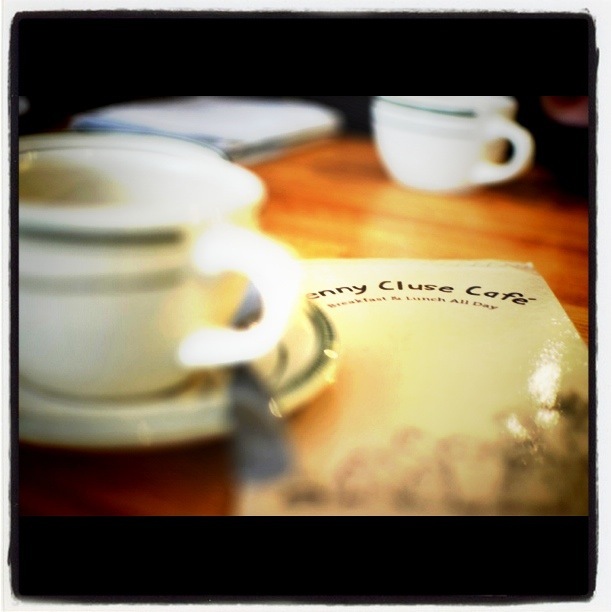 The time I spent at Penny Cluse will remain precious and close to my heart. 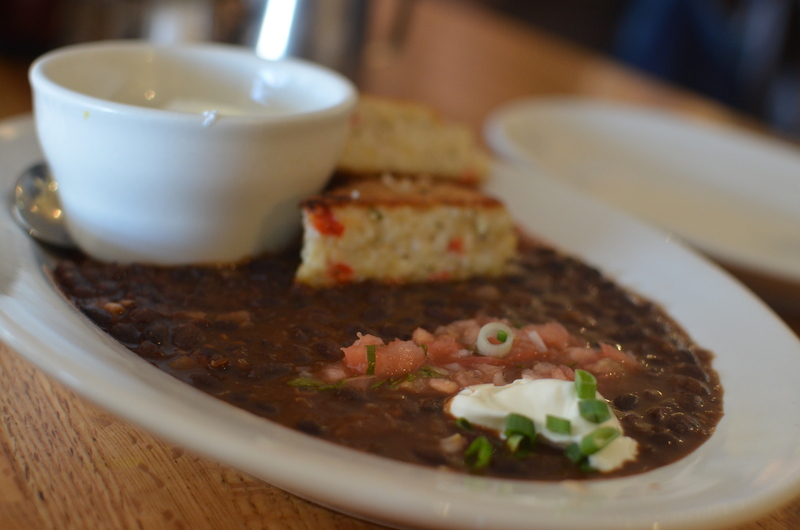 Smoked beans, polenta, and salsa ranchero with poached eggs…yum! It’s a Sunday morning and I share a late breakfast with a good friend. We decided to split a breakfast plate and banana bread at Penny Cluse. My friend Mohamed (photographer) suggested we split a dish. At first, I was a bit taken back because I usually order a plate for myself, but I realized that I have never finished an entire meal. Cues that prime consumption involve ordering one dish to consume entirely by yourself and accepting that the dish is one serving. Rather I found myself satisfied with simply splitting the meal. I considered a reading by Brian Wansink Food Industry Role in Obesity Prevention and how the food industry encourages consumption passed fullness by understanding two laws of consumption. “Consumer behavior in respect to food acquisition and consumption can be understood in terms of basic principles: The Law of least Effort and the Taste-Nutrition Tradeoff.” Wansink discusses the glorification of convenience in our American society. Designing food environments like restaurants, vending machines and delivery makes it easier for a consumer to overeat. The Taste-Nutrition Tradeoff Law focuses on the innate desire for fats, salts, and sugars. “Fatty foods helped our ancestor’s weather food shortages. In time of food scarcity or insecurity ‘good taste’, meant ‘good health.’”Wansink argues that the food industry can take innovative ideas and design products to prevent obesity and create a social responsible market through packaging or introducing children sizes. However, in Can the food industry play a constructive role in the obesity epidemic?, Marion Nestle believes the food industry has exploited and manipulated social responsibility in terms of health by promoting activity rather than focusing on consumption. “Thus, food industry strategies to increase revenues typically depend on “eat more” campaigns designed to promote larger portions, frequent snacking, and the normalization of sweets, soft drinks, snacks, and fast food as daily fare.” I agree with Nestle in terms of holding the food industry responsible in our obesogenic environment. It is imperative to allude to the fact that modeled behaviors do not necessarily lead to real world behaviors, but may contribute to how the public understanding about social responsibility and the food industry. Nestle continues to discuss the food industry’s attempt to combat childhood obesity. “Food companies tout their efforts to promote sports in schools or youth organizations.” Food industries are marketing themselves as socially responsibly in terms of combating obesity, but concentrate on expending calories rather than the over consumption of calories. Even if you involve activity, it may not burn all the calories an individual has consumed either in a soft drink or an order of fries. Nestle discusses that food industries target children and heavily engage in the marketing of unhealthful products to children with toys, ads, games and movie tie-ins, despite assurances to fight childhood obesity. In respect to personal responsibility and food industry’s responsibility, it is a complex issue because in order to combat obesity there needs to be pressure on the food industry, our government, academia and consumers. Food industries have the opportunity to package serving size, but government needs to lobby for healthier products to be marketed. We as consumers can vote with our forks. Childhood obesity rates are increasing and for the first time in history, American children could have a shorter lifespan than their parents. Wansink, B., & Peters, J. C. (2007). The food industry role in obesity prevention. In S. Kumanyika & R. C. Brownson (Eds. ), Handbook of obesity prevention:-A resource for health professionals (pp. 196). New York, NY: Springer. Wansink, B, & Peters, J.C, 197. Ludwig and Nestle (2008). Can the food industry play a constructive role in the obesity epidemic. JAMA,300(15), 1808-1811. Doi: 10.1001/jama.300.15. (pp1809). Brunch. 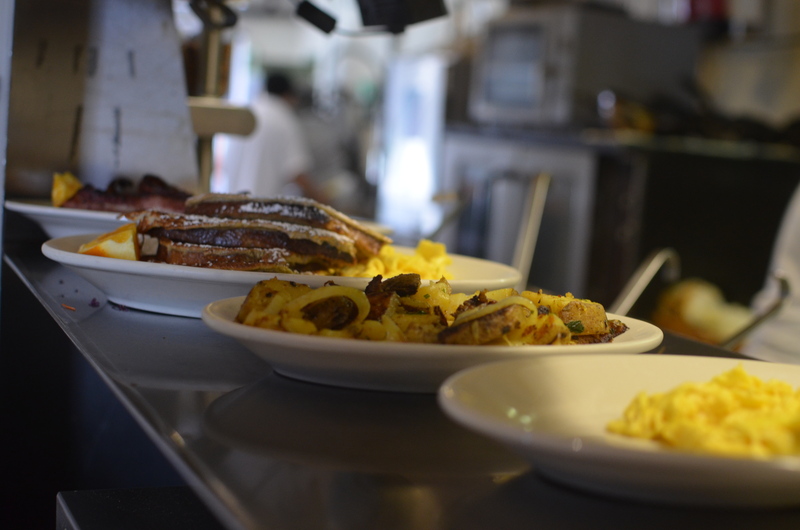 The art of brunch commences with the few extra precious hours of refreshing sleep. Brunch is a ritual that entices a positive and unique relationship with food. Brunch usually is associated with Sunday and on Sunday I attend mass and Penny Cluse. I began to wonder about the association between church and Penny Cluse. Both places are my sanctuary, my place to unwind and satiate my hunger for theology or breakfast. I ordered the hot granola with a side of fruit. I closed my eyes and simply immersed myself in the brunch environment. The warmth of sun permeating the window caresses my cheek. This is what makes Penny Cluse my haven. A wave of peace and mindfulness embraces my spirit. Church feeds my soul and Penny Cluse nourishes my spirit. I have become a devout consumer at this local restaurant in Burlington Vermont. The counter is my pew. Becoming in tuned with the Burlington community enriches my spiritual health. Numerous Spiritual/Religious practices focus on the importance of community. Every Sunday I experience a divine environment of cuisine and community. Inside Penny Cluse’s walls are conversations of politics, religion, love, culture, and food. The atmosphere and pulse of Penny Cluse nourishes not only my physical, but also my spiritual health. Once you sit down at Penny Cluse, the waiter immediately pours you ice water. I believe nothing is more refreshing than a cold glass of water. 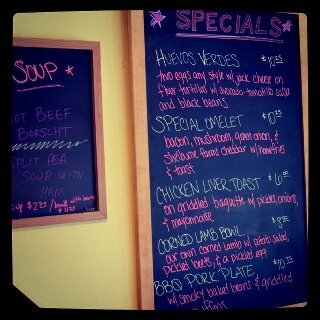 I ponder over the menu and see that I have yet to taste Mama Cruz’s Huevos Rancheros. I am a bit skeptical because I usually do not associate beans with breakfast. However, the meal was presented beautifully and the smell of cheese and tortillas lured me to take the first bite. As I eat a forkful of smoky black beans, I notice a hot sauce bottle on the counter. 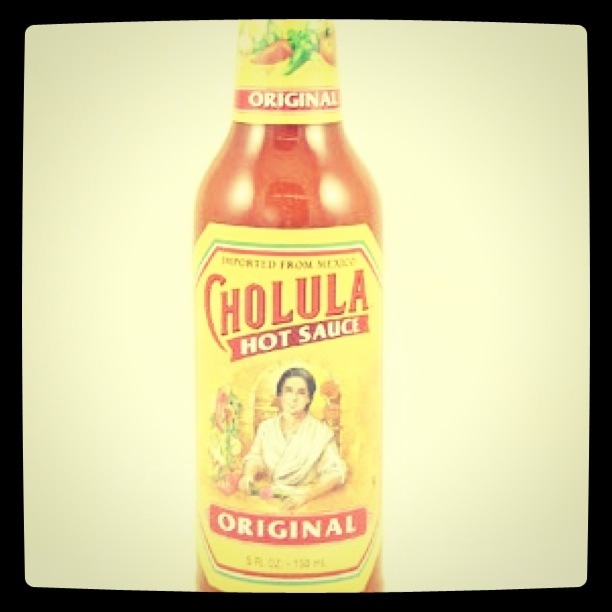 The Cholula bottle is accompanied with ketchup, sugar, salt and pepper, and the cream. Personally, I am not a huge hot sauce fan. Some people I know put hot sauce on every type of food…I mean every type. Other dishes I have ordered did not seem to encourage the flavor of hot sauce, but I decided to put some on my Rancheros. I seemed to be generous with the amount I wanted to try. Thank Goodness for the water! After my mouth stopped burning, I carefully added a smaller amount to my dish. The result was scrumptious! I stopped and wondered. Since the hot sauce was placed in front of me, was that an indication for me to consume it? Salt, pepper, and hot sauce are flavor enhancers. If the hot sauce were not readily placed in front of me, I would not have thought to try it on my dish. We instinctively want to consume food that is visible and accessible. Moreover, the hot sauce is not individually packaged, so how are we as consumers indicated on the correct portion amount for a single serving. In my case, it took me a couple of tries to find a perfect balance. Through a health lens, portion control is a major aspect in healthy eating. Hot sauce like any other food is good in moderation. According to Dr. Ghupta “Researchers are finding that capsaicin, the compound that gives chili and cayenne their zing, has a lot of health benefits: Capsaicin has even been put into topical creams that soothe sore muscles and joints.” However, too much hot sauce can lead to “abnormal blood clotting, blistering of the skin and severe diarrhea. Long-term use can lead to kidney and liver damage.” Over consumption and lack of portion control leads are some factors responsible for the United States obesity epidemic. Healthy eating can involve a little of hot sauce now and then, but as consumers we need to be aware of the amount we eat. Dr. Ghupta. There’s more to Hot Sauce than Heat. 2007 http://www.cnn.com/HEALTH/blogs/paging.dr.gupta/2007/01/theres-more-to-hot-sauce-than-just.html. Each time I visit Penny Cluse, I try to order a different dish. The three-folded laminated tan menu is abundant with scrumptious southwestern styled dishes. I gaze at the dish titles and connect how restaurants influence what we eat in terms of wording. In Brian Wansink’s Why we eat more than we think, he discusses the role of food cues in relation to consumption. Specifically, Wansink performed numerous studies where he described a menu that had either a generic/mundane name (Chicken Breast) vs. an eloquent name (Tuscan Sun-Kissed Breast of a Chicken).Although the foods were exactly the same, the participants said the eloquently named dish was far more enjoyable and therefore would be more likely to order it again. I want to specify that Penny Cluse’s menu titles cues are not modeled behaviors that lead to real world behaviors, but that these cues may contribute to how the public understands their food influences. With descriptive and creative menu titles, it pre-conditions consumers taste buds to have a high expectation of the dish. Penny Cluse’s Mama Cruz’s Huevos Rancheros, cues the consumer to believe that the dish is cooked by a mother figure. The title taps into the maternal emotion and reminds the Penny Cluse participant of home cooked meals, warmth, family, and love. Therefore, with emotions of comfort and home-cooked meals, we expect the meal to taste good. According to Wansink, he thinks there is a “loose relationship between reality and perception, while there’s a strong relationship between perception and your behavior” In terms of health, with titles like Sleepy Nate’s Biscuits & Gravy, Lunch with Lauren, and Bucket-O-Spuds, it influences consumers to have high expectations of taste. Such high expectations encourage the participants to a “clean plate” mentality. The “clean-plate” mentality suggests consuming food past your fullness, which results in addition of a few hundred more calories then needed. Sounds good right? Both of these dishes are Starters. 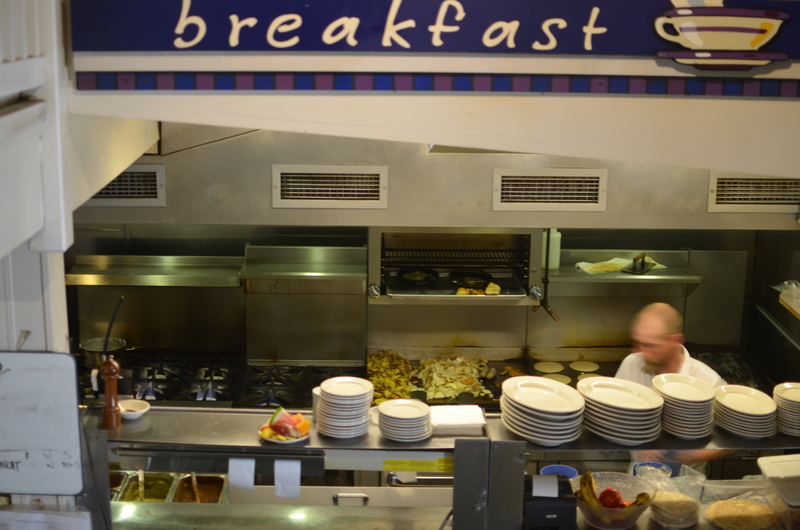 The menu implies that breakfast requires a starter before the meal, even though the meal is a significant amount of food. Through a health lens, the starters influences customers to consume more food. “Bucket” implies a massive portion of homefries and calories. The Starters can be viewed as a business strategy for Penny Cluse, but the health consequences may result in extra pounds and higher cholesterol via melted cheese. My family believes in cooking. In Colombia, there is a rhythm in the kitchen: the crunch of the lettuce, the clap of the knife when it hits the cutting board, and the sweet hum of my Abuelita. Familiar voices fall out of aged cookbooks in my kitchen when I flip through the recipe pages. I recall this memory as I slather Cabot butter on the warm flaky biscuit at Penny Cluse. I observe a couple to my right, sitting intimately close to one another. The couple browses through their new buy- a Comfort Food Cookbook. The association of eating comfort food at Penny Cluse and then cooking comfort food seems evident in this interaction. People that eat together cook together. The cherished moments made in the kitchen better enhances our emotional health and overall well-being. The couple tag off recipes, like Hearty Beef Stew and Mom’s Chicken Pot Pie. The cookbook strategically inserts words like: Hearty, Creamy, Mom, and Grandma in their recipe titles. The cookbook seeks to tap into the emotions and memories associated with meals. Eating or cooking a meal with someone promotes emotional and relational health. The conversations and topics that arise when baking cookies or grilling chicken feeds your soul. When we fall in love with a dish, we also fall in love with the story behind the fork. Penny Cluse satiates more than the physical health, but also the emotional and relational health. Penny Cluse is a sanctuary for eating. The experience of food and company encourages you to cook. To recreate the moment, you want to cook a meal as delicious and decorative with a special someone Maybe the couple will cook up Smoky Fries with Braised Polenta and create more than a meal, but a memory. I sit with my counter community on a sunny morning. I stab the mango slice. I detect a new art work. Before me is a sketching of an onion with a rather lackadaisical countenance. 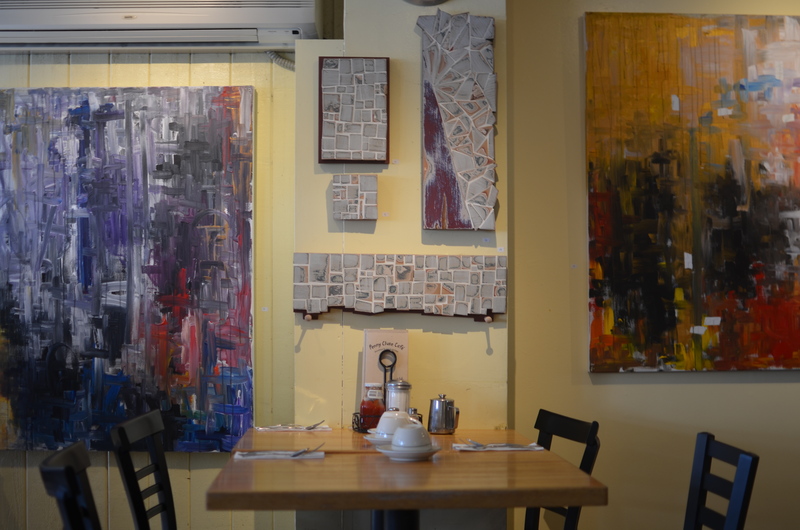 Art at Penny Cluse Café seems to have a shelf life. Somewhat like the vegetable itself. On the front of the menu appears an assembly of characters. A Carrot, onion, egg, cat, chili pepper and a fuzzy character I cannot make out. All with the same lighthearted disposition. Simplistic and amateur artwork with a side of eggs. Penny Cluse promoting healthy eating with vegetable characters. Did this artwork emerge as a statement to combat America’s obesity epidemic? A political and cultural art piece to continue conversations of health in America? Pollan’s “Eat your colors” comes to mind when viewing the sketches. Why do vegetables mean healthy? Vegetables offer an abundance of vitamins and nutrients. Or is the artwork encouraging more consumption. With 50 cents more, you can add spinach to your omelet. I can’t help but smile at the onion with the nonchalant countenance. A good start to my morning. My guilty pleasure in life is watching Cooking Shows. My family is a devoted follower of PBS/WGBH, so much that even my sister interned this past Summer with Antiques Roadshow. Therefore, I was inevitably going to fall in love with America’s Test Kitchen. 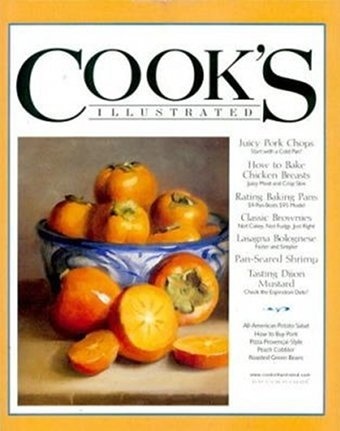 Each week, the cast of America’s Test Kitchen brings the recipes, testings, and tastings from Cook’s Illustrated magazine. America’s Test Kitchen features the enthusiastic host, Christopher Kimball. The opening shot is of Mr. Kimball on an open porch, sitting on a rocking chair. The set design of the show is in a Vermont Country Kitchen style (even though the shows are filmed outside of Boston). The clip proceeds with Mr. Kimball relaying historical facts of food with folk music in the background. 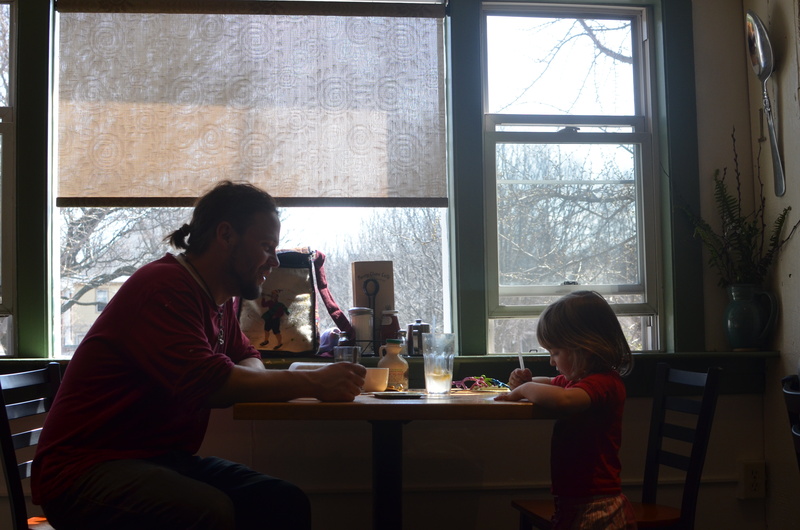 Kimball models good behavior through connecting food with comfort. Further in, you see Mr. Kimball fervently interact with his team regarding appliances, recipes, and taste testings. Some of the clip takes place outside, offering an intimate and interactive setting for the viewers. Food/cooking offers the audience a sensational and fantastical conversation concerning food through a dialogue of the host’s visceral senses (yum sounds). A Journal of Communication article: The Essence of Cooking Shows: How the Food Network by Cheri Ketchum discusses how the Food Network and how cooking shows creates a consumer fantasy in which you as the viewer becomes an active participant. According to Cheri Ketchum “The food network offers the possibility of pleasure through creating the fantasy of an intimate connection to viewers and the promise of satisfaction through consumption” (Ketchum 2005). This promise serves as an exciting experience for the viewer. According to Griffin, Social Learning Theory can be accomplished through observing and modeling behavior. In this case, America’s Test Kitchen models a behavior of home cooking with the team’s personal stories (ice-cream maker). Viewers vicariously experience food and cooking in a country kitchen setting. The show encourages the consumption of high quality home cooked comfort food, but in a health perspective the show does not provide information like calories, or portions. 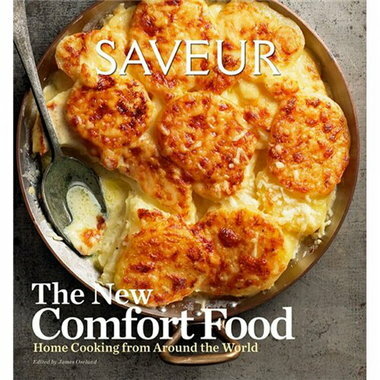 The foods featured are sensationalized, an example of this is when a co-host describes gravy as “the liquid of the gods.” Descriptions and consumption of comfort food, models the behavior of consuming high fat and high sugar ladened foods.